On this page, you can easily check whether you have won any prize in the Lotto. Our smart easy-to-use tool called Lotto results checker allows you to compare your numbers to the results from all draws in the National Lottery. You can check up to three lines of the latest 150 draws with each showing you your potential win. If you don’t know how to proceed read through our below guide with illustrations. We wish you best of luck! The checker presented at our website – lottomag.com – is free of charge. You can use it without any limitations. All what you have to do is to enter the desired data and within a few seconds you will see if you are one of the lucky winners. Enter your numbers once and the machine will remember them in the future, making it easy to find out whether you’ve won. Select the number of lines you wish to check. Pick your betted numbers for each line. Don’t worry about entering more or fewer numbers than required: The upper section of each line will show you the number of missing numbers or a message COMPLETED, which indicates that everything is O.K. and that you can proceed to Step 3. Pick the number of the recent lotto results you wish to check. Choose whether you want to display all draws or only those with a win. Finally, confirm your choice by pressing the green CHECK RESULTS button. Now, you must wait until the system has processed your numbers against the officially drawn numbers. This process takes a few seconds. All results will be displayed in a table from which you can easily find out whether you have won and if so, how much you have won. Watch lottery draws online: You can watch each lotto draw online via social networks or tools such as Facebook, YouTube or the National Lottery’s official website. Simply compare the results with those drawn during the live broadcast. Or, you can jot down your numbers at the edge of the ticket and do it afterwards. Matching two main numbers (or other winning combinations) is enough to win a prize. 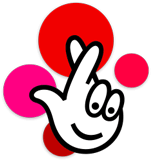 Replay the lottery draw– You can replay a video showing the draw later on at YouTube or at the National Lottery’s website. Watch BBC One: All results are announced on the BBC News channel at 10.40 p.m. immediately after the news. If you are absent to watch the draw online you can retrieve the results from the archives by pressing the red button on your remote control. At shop: Visit a shop to ask the retailer face to face. The retailer will upload your ticket into the system and tell you instantly whether you have won or not. Use mobile application: The National Lottery has developed a handy mobile application containing a feature called SCAN TICKET to check the results automatically. All you have to do is to scan your ticket and you will immediately see if you have won or not. By the way, this application has been described in detail in one of our recent articles.